One day while visiting my parents, I looked through some documents that belonged to my maternal grandmother, Gertrude Rose (Breen) Conlon. She lived with my family for two years until her death in 1992, and my mother still has some of her papers. While searching for a copy of my grandmother’s marriage record, I came across what appeared to be a bank book. 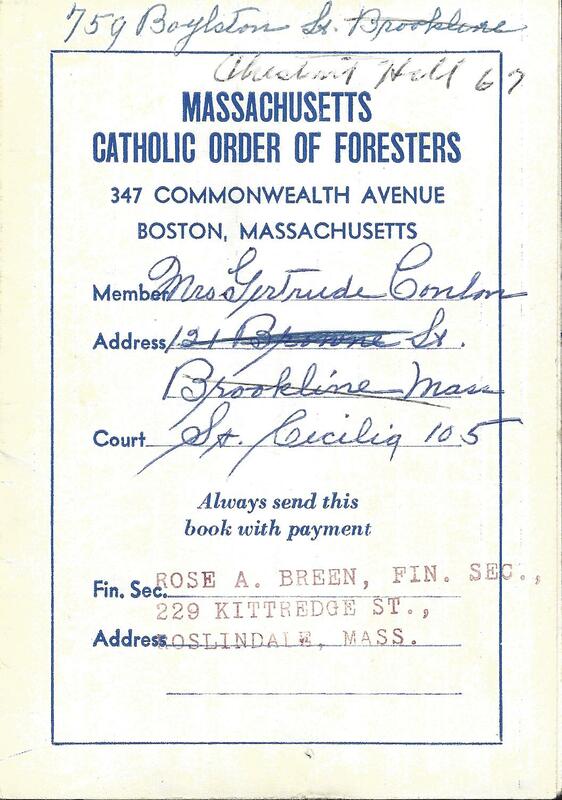 Upon closer examination, I noticed that it was a payment book for my grandmother’s account with the Massachusetts Catholic Order of Foresters (MCOF) . I recognized the name of this organization from research I previously conducted on the Irish lines of my family. My great-great-grandfather, James Conlon, was a member of the MCOF until his death in 1934. In 1879, a group of Irish immigrants founded the Massachusetts Catholic Order of Foresters, which provided life insurance benefits to its members. This organization, whose name was later changed to the Catholic Association of Foresters, is still in existence today. The membership and benefit records of those who died prior to 1942 are available for a fee through the Joseph P. Healey Library, located on the Boston campus of the University of Massachusetts. 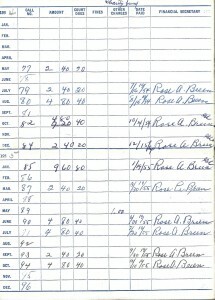 Entries in Gertrude Conlon’s MCOF payment book. By discovering this payment book, not only did I learn that my grandmother belonged to the MCOF, but I gleaned another interesting piece of information. 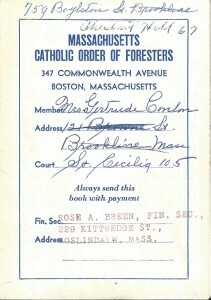 Listed on the cover of the book is the name and address of the Financial Secretary of the MCOF court where my grandmother was a member: Rose A. Breen of 229 Kittredge Street in Roslindale, Massachusetts. Rose was the mother of my grandmother Gertrude, and the daughter of my great-great-grandparents, Bernard and Josephine (Miethe) Grueter. The name of the MCOF court written on my grandmother’s payment book is Saint Cecilia’s Court, a chiefly German court located in Boston, Massachusetts. Rose A. 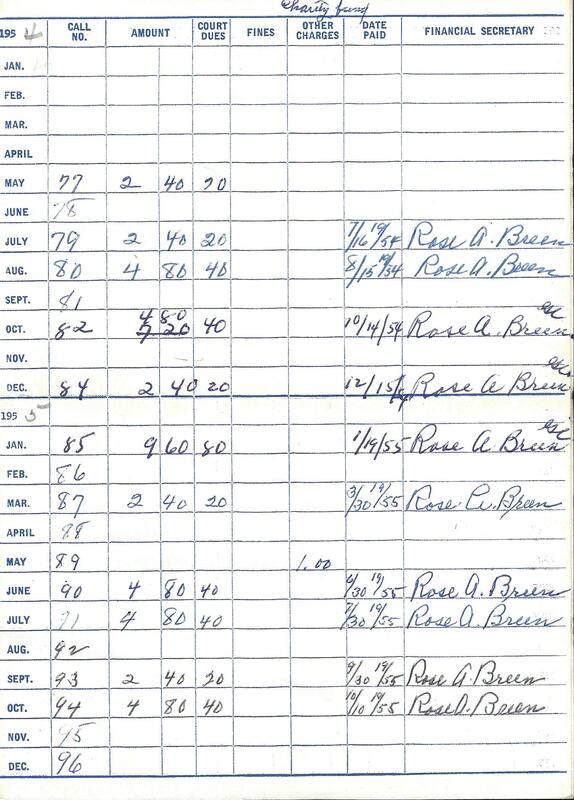 (Grueter) Breen died in 1957, so at this time her MCOF records are not accessible. However, discovering the payment book taught me that both my grandmother and great-grandmother had ties to this organization. 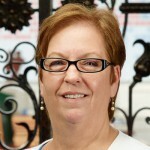 Very interesting Eileen, my grandmother was a bookkeeper for the Foresters. The “Mortuary” or insurance payout files are a treasure trove of information. They include the “court” name and addy, the insured health record very similar to information required today, death and survivors records and the payment checks. Several of the documents contain the signature or mark of the insured or beneficiaries. The files are $10 each and can be sent to you in a PDF. Oh wow! At 86 I had forgotten about the Foresters! I shall see if I am in their records. How fascinating. I haven’t heard of this organization before. Is it similar to the International Organization of Foresters? I don’t know if any of my ancestors were members of the IOOF, but a number, including a set of g grandparents, grandparents, and collateral relatives, are buried in the IOOF section of a cemetery in Walla Walla, WA. I could do some searching to see if there are records similar to what you found for your ancestors. Most of mine died before 1935, and the last in 1952. I never thought about these fraternal organizations and their insurance programs as sources of genealogical information. Thanks for your article! Doris, IOOF is usually the Independent Order of Odd Fellows. I have seen an Odd Fellows cemetery in southern Indiana, so I can verify that the organization did operate cemeteries.